Meet 'Hoola' bronzer, my new love! 'Hoola' comes in a cardboard box with 11gms of product for £23.50. The Good: A matte brown with a balance of cool and warm undertones. Highly pigmented, swatches true to the colour in the pan. finely milled, blends easily into the skin. You can get the colour to be sheer with a light hand or very intense if desired. The colour lasts all day and the product comes with a brush that is surprisingly soft. The Bad: The product can get dusty after you dip your brush in to it. The cardboard packaging can look battered if you let it bounce around in your bag. How do i use it? 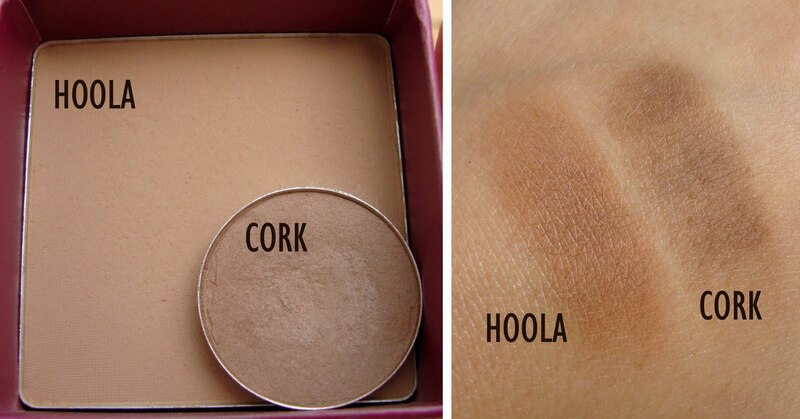 I mainly use it to contour on days where I feel my skin doesn't need moisture as my favourite cream bronzer is still the 'Soleil tan de Chanel', I have tried using 'Hoola' with the brush it comes with which basically gives you a stripe along your cheeks, it's good for contouring and on the go but you need a fluffy powder brush to then blend it out. I have been using 'Rimmel Stay Matte' pressed powder to set my liquid foundation to prepare for 'Hoola'. 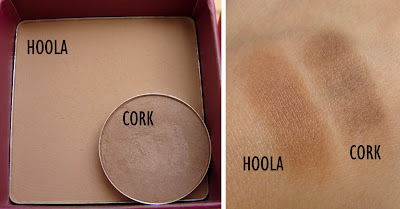 I thought that Hoola might be the same colour as Mac 'Cork' eye shadow but I was wrong, Cork is much darker and more cool toned. I would recommend Hoola if you want a matte powder bronzer which is natural looking with no orange or red undertones with practical 'on the go' pretty packaging. I prefer Hoola to Nars Laguna and Casino bronzers which have been favourites of mine because the shimmers in them make the contouring look fake and Laguna can look muddy and casino can look too red on me. I have also used Mac's matte bronzing powder, but that looks too red on me too. I have been using Hoola almost every day since I got it and I absolutely love how natural it looks on me. Have you tried "Hoola"? If not, what matte powder do you use to contour? I love how brown it is as opposed to most of my bronzers they always tend to have an orange after glow. I need a new bronzer once my tan fades def have to check this out. fab post, I've been eyeing this up for a long time! How do you think this would perform on paler skintones? During the summer it ends up being my all over face powder, which makes me happy. But I agree bout the packaging I borderline detest it. It's only cute when the box is brand new. you know I switched from Hoola to NARS laguna and now you're making me want to try the Hoola again! I never thought of getting Hoola or Georgia out of the Benefit boxed powders. I have all the rest! I much prefer to contour using the Chanel Bronze Universal or the Nars Capvert multiple. Cream bronzers usually look more natural on me. Oh noo don't buy Georgia!! I have a bunch of the boxed powders from benefit and did a comparison of them a while back, and it's my least favourite. Georgia does absolutely nothing...but it does smell the best!! It's one of my biggest makeup regrets, especially with the heavy price tag. I'm half turkish, so I have olive undertones, but I'm still pretty pale...and georgia does nothing on my skin, however I do mix it with heavier/more pigmented blushes to tone them down. LOVE Hoola, but sadly I can only wear it in the winter as that is the only time is shows up on me. In the summer I have to use it as a face powder, which I have been doing lately! hoola is pretty nice, I enjoy it as well, and I have dandelion and sugarbomb as well, both great for fair skinned girls. I just bought Coralista and I LOVE it... it is such a pretty pink coral. Trust me, do not buy Georgia! I'm half Persian and have a similar skin tone as you, and you can't even see that I'm wearing anything with Georgia. Total waste of money. Although I do agree with Obsessed.Makeup.Addict, Georgia does smell good! I have Hoola and I do like it but I noticed I reach for my NYC Sunny bronzer more. Thanks for the review love! I've used Hoola for two years and it's a great bronzer! I think you can pull off Georgia, I mix Georgia and Hoola, and it gives a nice glow. I wish to have this one day 'cause it looks so nice!! LOVE this bronzer, and your blog! You always do such useful and interesting reviews of products. You've reminded me of how amazing this product is and how much I need it back in my life! I use Laguna bronzer by NARS, it does have a very small touch of shimmer but it AMAZING! I have always wanted to try HOOLA and maybe this is a sign to buckle down and make the purchase! Thanks! Muhsine! I've missed you! I've got a question for you, mind if I emailed it? I'm sending it to several buddies ans also sharing in delicious. And naturally, thank you in your effort!